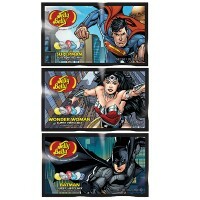 For a true all-American treat, what could be better than Jelly Belly Super Hero jelly beans? This 0.99 oz. bag combines two US favorites - jelly beans and super heroes. 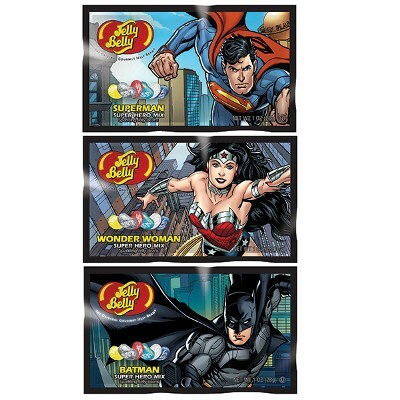 Each bag features an all-time favorite hero like Superman, Batman, or Wonder Woman. Inside you'll find Jelly Belly Beans flavored with sparkling cream soda, sparkling blueberry, sparkling very cherry and more! Sugar, glucose syrup, modified corn starch, puree (blackberry, lemon, blueberry), acidity regulator E297-E325-E330-E331, flavorings, concentrates (spirulina, apple, carrot, pumpkin, black currant, cherry juice), glazing agents E901-E903-E904, colors E100-E153-E171, salt. Nutrition facts (for 100): calories 360Kcal, total fat 0g (saturated fat 0g), total carbohydrate 90g (sugar 65g), protein 0g, salt 0g.